This plugins allows students to receive a notification as soon as new material becomes uploaded. Optionally the new file can be included in the mail directly. For updated material a changelog will be displayed which includes the changed page for PDF documents. After installation define your admin settings to customize the plugin behaviour. See chapter Features of this document for more information. Install PHPUnit on your system and configure moodle. See https://docs.moodle.org/dev/PHPUnit for more information. The plugin can inform your students as soon as new material is published in one of their courses. The delivered mail can optionally include the new file. These functions must be enabled by three parties: The moodle admin, the teacher and the student. The options for courses and for students are only visible if the admin has enabled the feature. Set Allow notification mail delivery to yes. This will enable the mail delivery for course admins and students. If you set it to no, the delivery is completely disabled: No one can see the settings and no mails will be send in any case. Set Maximum filesize of mail attachments (in KB) to 100000. This will allow attachments up to 10MB. If this value is zero, no attachments will be send. Now the feature is visible for teachers and students. As a general rule: A mail will only be send if someone (teacher or student) has requested the delivery and no one has forbidden it. No preferences The default option. No mails will be send except the user requests them. Disable No mails will be send for actions in this course. The student settings are ignored. Enable Mails will be send except a user has disabled the delivery for himself. Set the check mark for Allow email attachments (this is the default). This will allow students to receive mails with attachments. As a teacher you can not force this to avoid unwanted traffic. 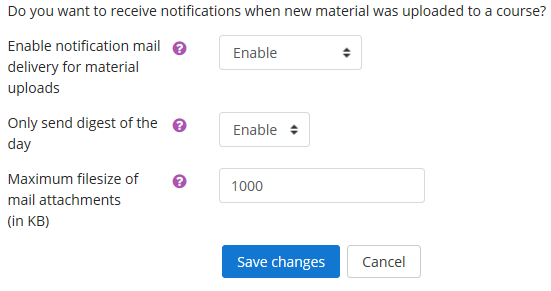 Enable notification mail delivery for material uploads with the same options as teachers. No preference will only send mails if the course settings have enabled them. 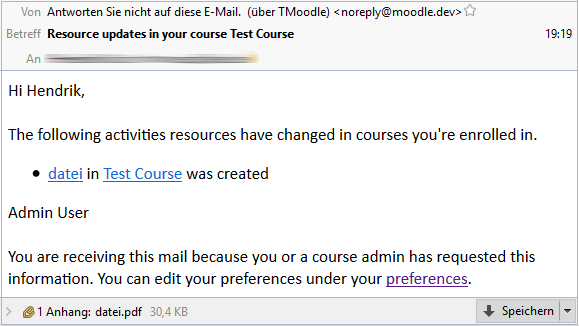 Enable sends always mails except a teacher has disabled the feature for a course. Disable will never allow the mail delivery to this student. Maximum filesize of mail attachments (in KB) Insert a value greater zero to receive attachments up to this size. You can not request sizes which are greater than the limit of the moodle admin. The attachment will only be send if the teacher has not removed the check mark in his his course. The plugin can build a changelog for uploaded resources. It will include the timestamp of the update and the filename of the predecessor. At the moment only file resources are supported (no folders, pages, or others). For PDF documents, the plugin can detect the page number on which changes were performed. Edit the current resource and select a new file. A file and its predecessor must be uploaded in the same course and section. To enable the changelog, the moodle admin has to allow this feature. If he has deactivated it, teachers will not see the options in the course settings. Set Allow automatic changelog generation in courses on true. This will activate the feature for teachers. Set Allowed size of analysed files for the diff detection (in MB) to 100. This will allow the plugin to search for differences on documents with maximum 100MB filesize. If you set this value to zero, a changelog can be generated, but the pages where changes are performed will not longer be identified. 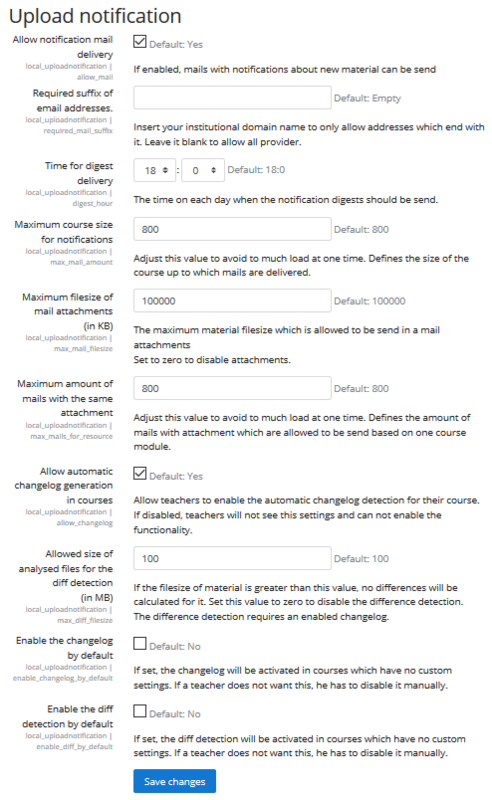 Set Enable the changelog in new courses by default and Enable the diff detection in new courses by default to true. This will activate the changelog and diff detection in all courses which have no custom settings. Set Display a changelog for updates to true. This will print an information with the filename of the predecessor and the time of the change next to the new document. Set Detect differences in updates to true. This will search for changed pages in the new document and add their numbers to the changelog. This feature only works for PDF documents which are smaller than the admin-limit. Create a new PDF document in your course. Edit the new document and upload an update with a few changes. On the course page, the changelog will be displayed. Delete the updated resource and upload a version which was changed again a little bit. This upload must be in the same section as before. After a page reload (limitation of moodle because the upload was performed via ajax) the changelog is displayed again. * I saw that you have enabled the digest delivery of mails for your test-student. In the admin settings a delivery time at 6 am is defined. Have you waited until this time? Has your server set the correct system time? You can try to disable "Only send digest of the day" for your test-student if you want to send the mails directly. * There is a delay of five minutes between the upload of material and the first possible notification time. This should ensure that teachers can edit their material before everybody gets a mail. As a result the delivery might be five minutes later than expected. * The plugin uses the cron job provided by moodle. As long as this task is not executed, no mails can be sent. If all of the above ideas do not fit for your situation, you can have a look in your database. The plugin creates a table local_uploadnotification in which all planned and not already delivered mails are stored. When you upload a file, a new record will be created. When the mail is sent, the record becomes deleted. You can check whether the records exist in your system. This might help to identify the problem. By the way: I found a bug in the plugin's code while searching for a solution for your problem and uploaded an update of the plugin. The digest minute field was wrong interpreted. It was used as a seconds definition and not for the minutes. However, you have already set zero minutes for the digest in your system, so it should not make any difference to you. I highly appreciate your detailed comment. There were issues in the mail server. Thank you very much. We are getting notifications on test-id via email. I have enabled all the notifications for web, mobile and email. Please suggest how to get push notifications on mobile for new material uploads. I'm glad to hear that it works now. Unfortunately, push notifications on mobile devices are currently not in the scope of this plugin and in the near future, I will not have time to implement this functionality. But if you or someone else has programming experience, I encourage any to contribute. Just create a pull request on Github and I will merge the code. * The digest delivery will only be used if students explicitly enable it in their settings. The default option is a just-in-time delivery. * There is (a hard coded) delay of five minutes between the upload of a file and the first possible mail delivery time. This delay should ensure that teachers can edit their material before everybody gets a mail. If you want to change this behavior, you have to edit the source code. I think you would just have to change this line: https://github.com/hwuerz/moodle-local_uploadnotification/blob/master/classes/util.php#L96 But this hint is untested, so you should try it out first in a test environment. * Mails are only send when the moodle cron is executed. You can run it more often to decrease the time until mail delivery. If I add some activity in my course at 06:00 a.m, set digest delivery at 07:00 a.m and the moodle cron will executed at 07:01 a.m. What the time mail notifications can be sent? or what time will the student receive a notification email? the answer to your question depends on the settings of the students. 07:01 am: No action because the planning time plus five minutes (= 07:05 am) is still in the future. If changeloglib is not previously installed, installing this plugin causes error 500, which was not fun to trace and fix. Have you deleted the uploadnotification plugin? install the poppler & check diff in your system (linux's server) with the terminal or putty, and then install the changloglib (changloglib required poppler & diff), Finally install the uploadnotification. Thank you for the answer. I had run the cron job every 2 minutes, before I installed this plugin. where can I check if the notification email is not sent? I have checked in the mail server, there is no email about that notificiation. Thanks. In addition, the plugin only sends mails to registered _students_. As an admin, you may not get any notification. Did you check the inbox of a student of the course? Did you activate the notifications in the course? It can be done at Course Page -> Settings Icon -> "Upload Notification" -> "Enable notification delivery for material uploads" -> "Enable"
If these points have not yielded any results, you can look directly in the database. The plugin creates a table called local_uploadnotification in which all planned and not already delivered mails are stored. When you upload a file, a new record will be created. When the mail is sent, the record becomes deleted. You can check whether the records exist in your system. Unfortunately, there is no dashboard for this data. So you have to look directly into the database via the command line or use an external tool like phpmyadmin. The problem is over. I have changed the SMTP Session limit (before : 1, after : 10/ session), that's what makes email not sent. If create some activity -> create record in the database (automatically), after 5 minutes the data is lost. If the database is empty (no record in the table), the email should be sent. If not sent the problem is SMTP Session limit. I think that's the problem.